The best way to get around Nova Scotia is by car. Driving across the province gives you freedom to go wherever you want, including places that public transport doesn’t reach. You can either rent a car, bring your own or come by motorcycle or RV. Once here, you’ll need to follow Nova Scotia’s road rules. Getting around without a car is challenging but possible as long as you’re happy going to the main sights and not the most rural locations. If you don’t want to drive, you can travel much of Nova Scotia by public bus, private shuttle bus or with an organised tour. 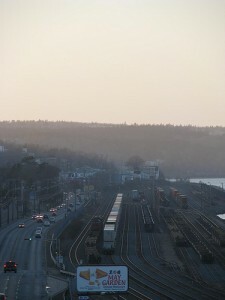 The train can also be useful if you’re going to Halifax, Truro, Springhill or Amherst. An adventurous option is to ride your bicycle in Nova Scotia. It’s relatively compact. The rural roads are quiet. The scenery is fantastic. The camping opportunities are abundant and there are plenty of B&Bs and hotels for a touch of comfort. What more could you ask for?